Thailand is the host of the upcoming ASBC Asian Confederation Boxing Championships which will be held in Bangkok, Thailand from April 18. AIBA medallists of the team such as Chuthamat Raksat, Sudaporn Seesondee and Chatchai Decha Butdee could be the main weapons of the country on home soil. Six female and eight boxers have been selected to the team to attend in the ASBC Asian Confederation Boxing Championships. Their Cuban head coach involved several stars and also newcomers to the squad to manage their long term career. Thailand sent boxers to the Bocskai Memorial Tournament to Hungary, to the Duisenkul Shopokov Memorial Tournament to Kyrgyzstan, to the Gee Bee Tournament to Helsinki and also to the Cologne Boxing World Cup to Germany. Following their preparation and selections the team is ready to win top bouts in the ASBC Asian Confederation Boxing Championships. Chuthamat Raksat claimed bronze medal in the Jeju 2014 AIBA Women’s World Boxing Championships and will be attending at the flyweight (51kg) in Bangkok. Their best female hope could be Sudaporn Seesondee who claimed silver in the New Delhi 2018 AIBA Women’s World Boxing Championships and finally she found her best category the lightweight (60kg) in the recent one year. Nilawan Techasuep earned bronze medal in the Jakarta 2018 Asian Games and the tall boxer won the title in her last preparation event at the Duisenkul Shopokov Memorial Tournament. She will be boxing at the featherweight (57kg) in the ASBC Asian Confederation Boxing Championships and could be a secret weapon for the host country. Sikadon Ratchaneekorn (48kg), Jeerapak Inkam (54kg) and Suchada Panich (64kg) were also involved to the Thai squad but all of them have got medal chances. 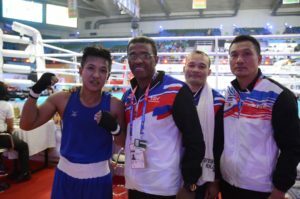 Chatchai Decha Butdee is a two-time Olympian boxer who earned bronze medal at the Almaty 2013 AIBA World Boxing Championships before he became ASBC Asian Champion in 2015. His veteran teammate Saylom Ardee is member of the national squad since 2005 and following Beijing, London and Rio de Janeiro, he is aiming for a spot to his fourth Olympic Games therefore the ASBC Asian Confederation Boxing Championships is a very important step for him. Samak Saehan will be representing Thailand at the men’s light flyweight (49kg) this time following his titles in the national events. Rujakran Juntrong took bronze medal in the Jakarta 2018 Asian Games and silver in the Bocskai Memorial Tournament this February therefore his expectations are also high at the lightweight (60kg). Somchay Wongsuwan is only 23 now but he has been attending in the international events since 2014 and replaced star Wuttichai Masuk at the light welterweight (64kg). Chakapong Chanpirom competed for Thailand previously and after a break he decided to return to the ring and will be fighting for the Southeast Asian country at the flyweight (52kg) in Bangkok. Terapong Dee is a veteran boxer who will be competing at the middleweight (75kg) while former ASBC Asian Confederation Boxing Championships bronze medallist Anavat Thongkrathok (81kg) also included to the squad.